THOSE who backed New Zealand raider Cruz Bromac when betting markets first opened must be feeling pretty pleased with themselves. Listed at $11 during early Inter Dominion markets, the son of Falcon Seelster now shares favouritism with his stablemate, Spankem. Prepared by Mark Purdon and Natalie Rasmussen, the geldings sit at the top of TAB’s Fixed Odds for the December 15 Final at $4. Spankem and Cruz Bromac proved too slick for their rivals during last weekend’s opening round of heats at Tabcorp Park Melton, with the latter remaining unbeaten in the series after capturing his qualifier in Ballarat just moments ago. With Rasmussen in the cart, Cruz Bromac was settled at the tail of the field from his second row draw before being sent forward to race outside the leader, Audi Hare, at the bell. Forging his way to the front halfway along the home straight, Cruz Bromac scored by three metres from the pacemaker, with Galactic Star a head away third. “That was another very nice run from him,” Rasmussen said. “He did a bit of work for the last lap and still hit the line well. Rating 1:53.5 over 1710 metres, the seven-year-old’s time was 1.3 seconds slower than fellow Kiwi pacer, Im Pats Delight, in the middle heat. Driven by Gavin Lang for trainer Cran Dalgety, Im Pats Delight led throughout to account for Cant Refuse and Im The Boss. Local hope Wrappers Delight has also tightened in the market following his 1:53.6 win in the first of tonight’s heats. 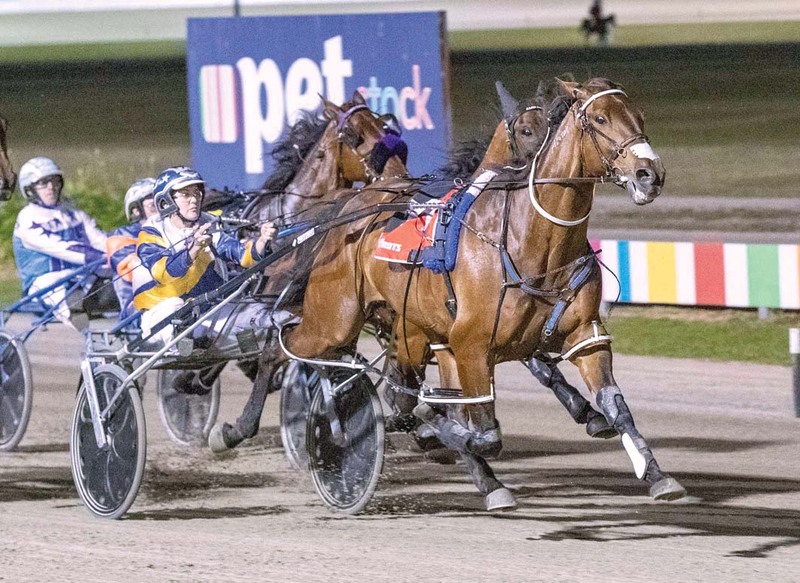 Leading from the pole for reinswoman Kima Frenning, the Australian Pacing Gold purchase completed a metre-and-a-half win from Tiger Tara, with Spankem a metre away third. As such the David Aiken-trained son of Bettors Delight has dropped from $11 to $8. “He did such a terrific job,” Frenning said. MISTRESS ON THE PATH TO MOTHERHOOD.